Pediatric Pharmacy ensures safe and effective drug use and optimal medication therapy outcomes in children up to 18 years of age. There are almost 1,000 BPS Board Certified Pediatric Pharmacy Specialists. 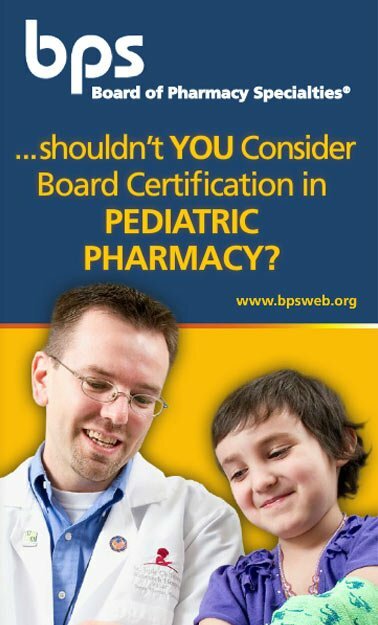 The BPS Board Certified Pediatric Pharmacy Specialist® (BCPPS) program is a credential for pharmacists who have met the eligibility criteria below and who in their unique practice ensure safe and effective drug use and optimal medication therapy outcomes in patients up to 18 years of age. Providing patient care to children, including providing alternative dosage forms and specialized drug therapy monitoring required for pediatric patients. Advocating for and educating children and their families about medications. Promoting wellness, health, and other activities that advance knowledge in pediatric pharmacy for both patients and other health care providers. Achieving a passing score on the Pediatric Pharmacy Specialty Certification Examination. Refer to the Pediatric Pharmacy Content Outline for details. Earning 100 hours of continuing education credit provided by the professional development programs offered by the American College of Clinical Pharmacy (ACCP) and/or the American Society of Health-System Pharmacists (ASHP) and/or the Pediatric Pharmacy Advocacy Group. Pediatric Pharmacy Preparatory Review and Recertification Courses offered by any of the approved providers may only be completed for recertification credit up to two times, in nonconsecutive years, during the 7-year recertification cycle. **To achieve the 100 hour requirement, the BCPPS may participate in recertification offerings from any of the BPS-approved pediatric pharmacy providers. Board Certified Pediatric Pharmacy Specialists® are also required to pay the BPS Annual Certification Maintenance fee of $125 each year for years one through six and a $400 recertification fee in year seven. Achieve a passing score on the BPS Pediatric Pharmacy Certification Examination. Earning 100 hours of continuing education credit provided by the professional development programs offered by the American College of Clinical Pharmacy (ACCP) and/or the American Society of Health-System Pharmacists (ASHP) and/or the Pediatric Pharmacy Advocacy Group (PPAG). Pediatric Pharmacy Preparatory Review and Recertification Courses offered by any of the approved providers may only be completed for recertification credit up to two times, in nonconsecutive years, during the 7-year recertification cycle.